Consider thatÂ this one of the rare CGI films that pays respects to traditionally animated films; remember that Tangled (2010)Â was specifically designed to look like oil paintings and 2D animation. Rango achieves this without the oil painting angle, and does so seamlessly. I couldn’t point to one shot that didn’t look carefully rendered. I also had a hard time not picking out references to other films. I like movies that respect their elders. Nods to Star Wars, Raising Arizona (tell me that score doesn’t have echoes here), and obviously older westerns are everywhere. There’s even a certain cameo that ties the entire story togetherÂ and referencesÂ that by whichÂ the entire Western genre has come to be recognized. Our story is simple: a weak man becomes the hero of a small town after a couple of white lies, and discovers what a hero really is in the process. And it’s safe to say that this would be less of a film if it weren’t for Depp’s heartfelt performance – it’s truly beautiful work, and indicative of the kind of actor he used to be. Lately, he’s become his own stereotype (oddball actor doing oddball stuff), but if we think back to his work in Jim Jarmusch’s Dead Man (1995), or even his early Tim Burton work like Edward Scissorhands (1990), it’s easy to remember how much work he put into everything he did. He always stretched himself,Â but you’d think that doing voice work for a lizard posing as a cowboy wouldn’t be too much, something you could just phone in and still achieve the desired effect. However, I’d rankÂ this performanceÂ among his best – it’s the sort of character mining and creativity he used to, and hopefully will continue to, display. The supporting cast, while not having nearlyÂ as much to do, does wonderfully, and it’s a hell of a cast: Ned Beatty, Bill Nighy, Ray Winstone, Abigail Breslin, Timothy Olyphant, Stephen Root, Harry Dean Stanton. With a cast like that, a director like Verbinski ( the 2002 American remake of The Ring), and a screenplay from John Logan (Gladiator, The Aviator),Â the recipe for success is complete. There are several themes touched upon in this film: loneliness, what it means to be a hero, finding yourself, and – perhaps the biggest metaphor offered – thirst. While searching for the town of Dirt’s missing water supply in the middle of the desert, we’re treated to an underlying message that the film doesn’t boldly state – the thirst to belong, and be something that we aren’t. 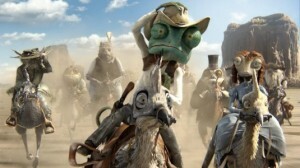 Rango (Depp)Â lies his way to the top, and will inevitably be found out in one way or another; he does this because of loneliness, because he wants to be a hero, and because he has no idea who he truly is. It’s through these experiences that he’ll discover his purpose and his drive. He meets a woman as strange as he is, who knows something is off all over town, and all of the other desert settlers look to him as their savior. The pressure is on, in more ways than Rango is prepared for. The fun isn’t just searching for the water and solving the mystery, the fun is in watching Rango come into his own. Or, if I may, shed his own skin. I certainly wasn’t prepared to be emotionally effected by a movie like this, and I think that has a lot to do with this film’s surprise success. I’ve heard “Oscar contender” mentioned several times in conjunction with this one, and I’ve seen four star reviews all over the place. Tack on four more stars from me. This just goes to show that audiences are wanting smarter movies, and more directors are ready to branch out from what they’re normally known for. Edward Zwick doing romantic comedies (Love and Other Drugs), Darren Aronofsky doing horror (Black Swan), and Gore Verbinski doing cartoons -Â I love where we’re headed. whoah this weblog is magnificent i really like reading your articles. Stay up the good work! You realize, lots of persons are searching round for this information, you can help them greatly. I do believe all the concepts you’ve introduced to your post. They are very convincing and can certainly work. Still, the posts are very quick for novices. May just you please prolong them a little from next time? Thanks for the post.